LINE, Twitter and Instagram are in. Facebook is out. Young people drastically disengage from Facebook. Each platform presents noteworthy differences in their audience’ s psychographic attributes and motivation of use. 1. LINE, Twitter and Instagram are in. Facebook is out. 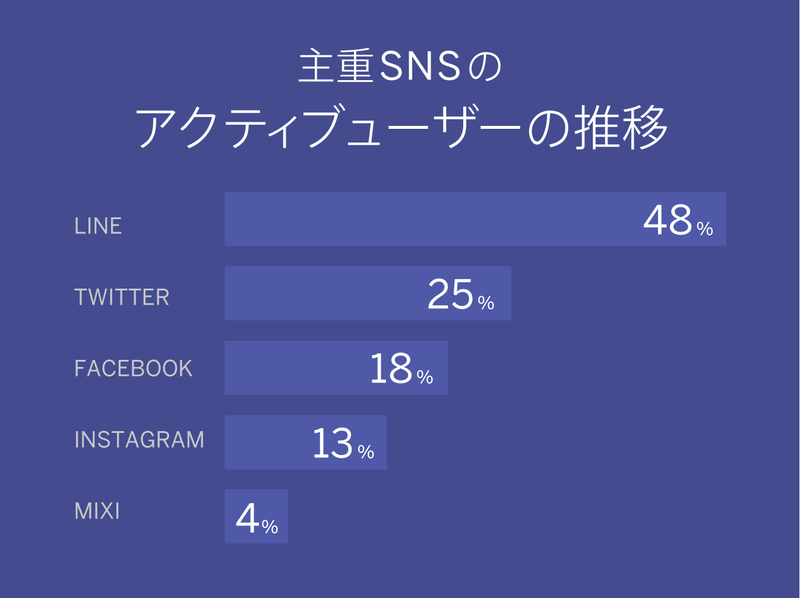 Using data from our survey of 4,395 Japanese men and women aged between 15 and 64, we examined the Active Users (people having responded, “I use it daily”) of the main Social Media. Chart 1 shows the trends of Active User rates (a percentage of the Japanese population). LINE is now used by over a 50% of Japanese. 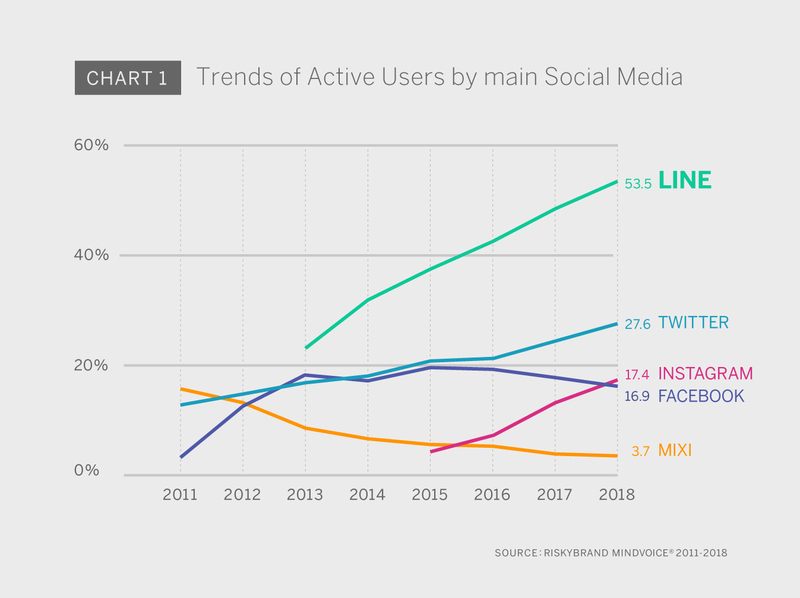 Along with Twitter and Instagram, it is currently one of three steadily growing platforms by number of Active Users. After a peak in 2015 (19.5%), Facebook has been slumping. 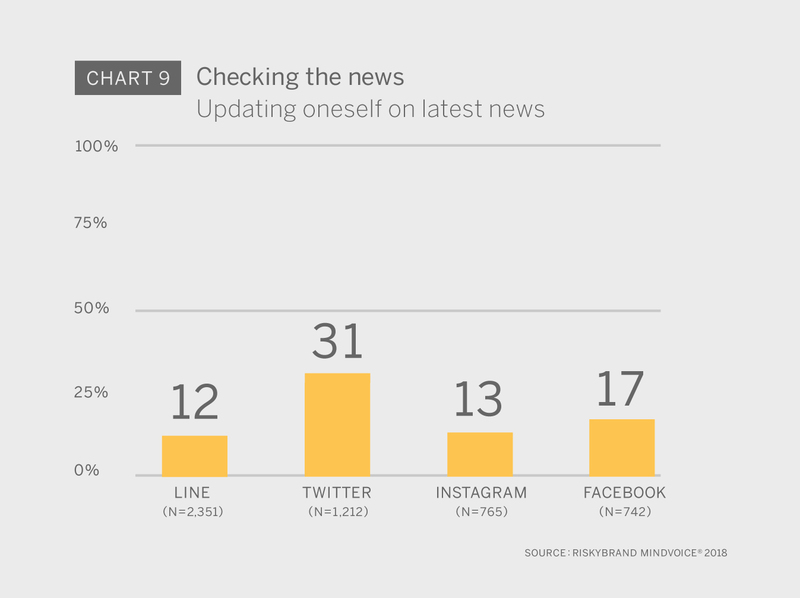 In 2018, it bites the dust at 16.9%, 0.5 points under Instagram (17.4%). 2. Young people drastically disengage from Facebook. Chart 2 plots the trends in Facebook active user rates for each age group. 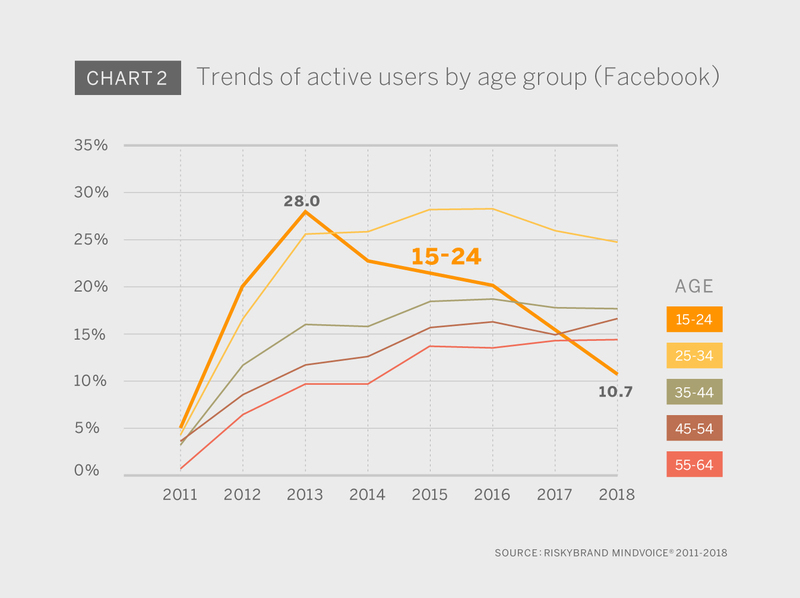 As chart 2 shows, while the user base is still growing among those aged 45 and over, the younger generations are deserting Facebook, particularly the 15-24 among whom the Active Users of Facebook dropped hugely from 28% active in 2013 down to only 10.7% in 2018. Conversely, 15-24 year olds are rapidly adopting Instagram. Chart 3 shows this with the trends in Instagram active users for each age group. 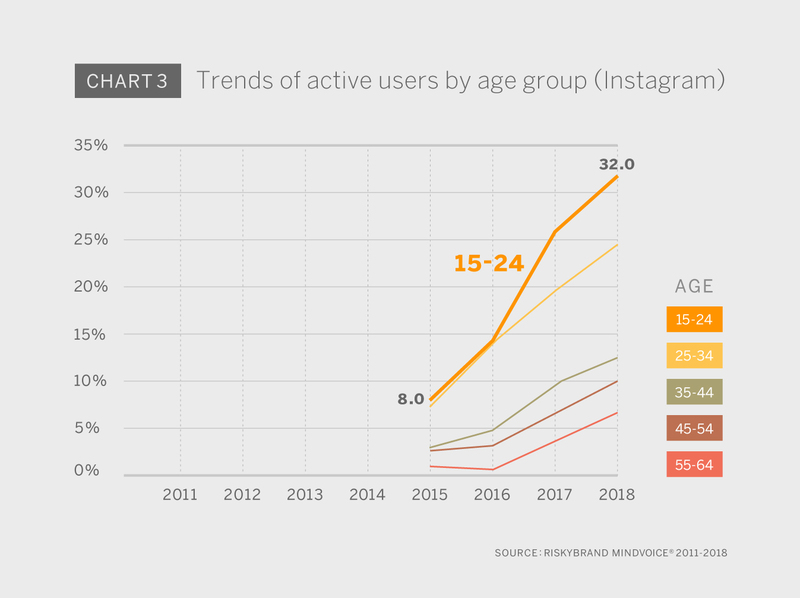 As Chart 3 shows, the Instagram Active Users among 15-24 year olds are rapidly increasing from 8.0% in 2015 up to 32% in 2018. Simultaneously, Instagram adoption is also growing in other age groups. 3. Social Media are split by usage and individual values. A. Differences in user age groups. 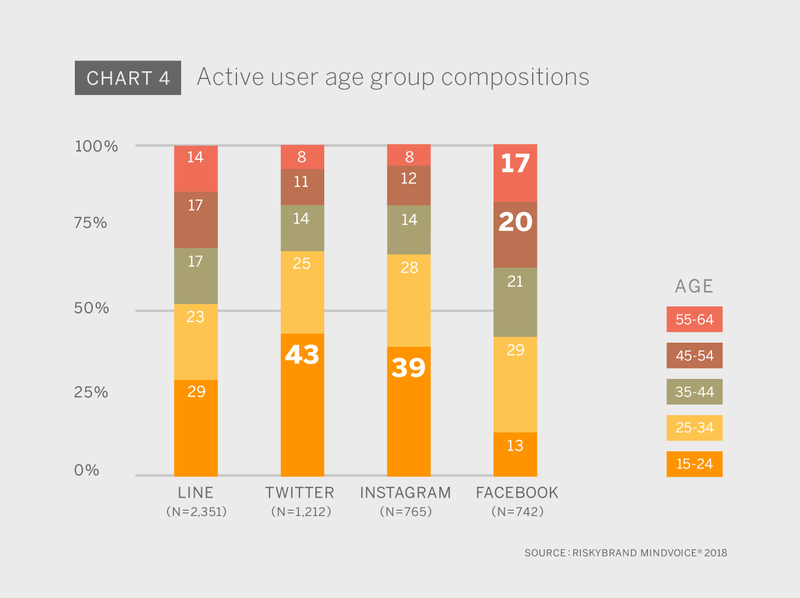 Chart 4 shows the active user age group compositions for the main Social Media. The LINE user base is rather evenly split among age groups, Twitter and Instagram heavily skew towards the 15-24 year olds, while Facebook skews towards the 45 and over. B. Differences in individual values. Chart 5 maps on a matrix the main Social Media according to differences in individual values of the active users. In this chart, the centre point of the matrix is the average for the Japanese population. From there, Instagram and Facebook users exhibit values that place them in the top right corner, while Twitter and LINE users tend to be placed in the top left corner. 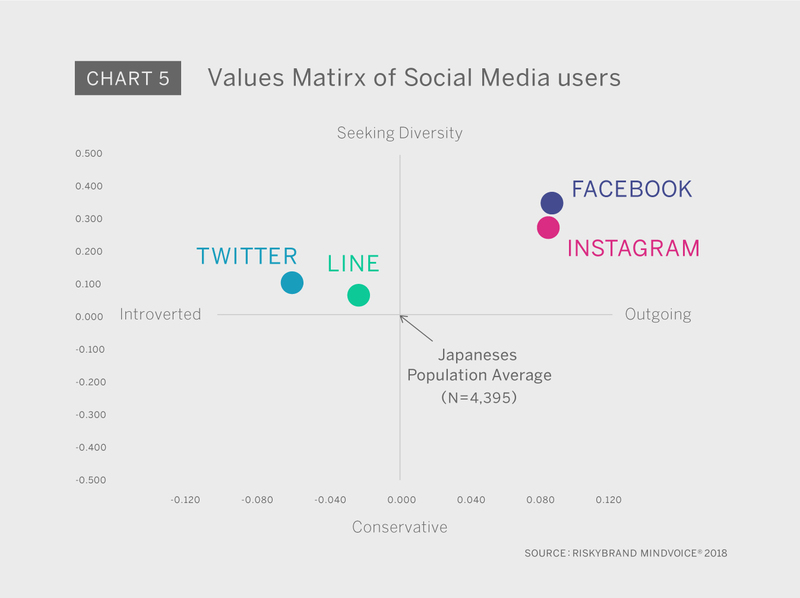 The users of these majors Social Media all have in common a proclivity for change and diversity, but while Instagram and Facebook users tend to be more sociable and extroverted, those of Twitter and Line do weigh more on the side of introversion than the average Japanese person. Here, we look at the different uses that Social Media users may have for each Social Media. Hence, rather clear positions emerge: LINE as the main mode of contact on the one hand and Twitter, Instagram and Facebook as modes of disseminating information on the other hand. Indeed, with 85% of the active users of the most used platform using it for contacting each other, LINE almost holds a monopoly over the most fundamental position: private personal communication. 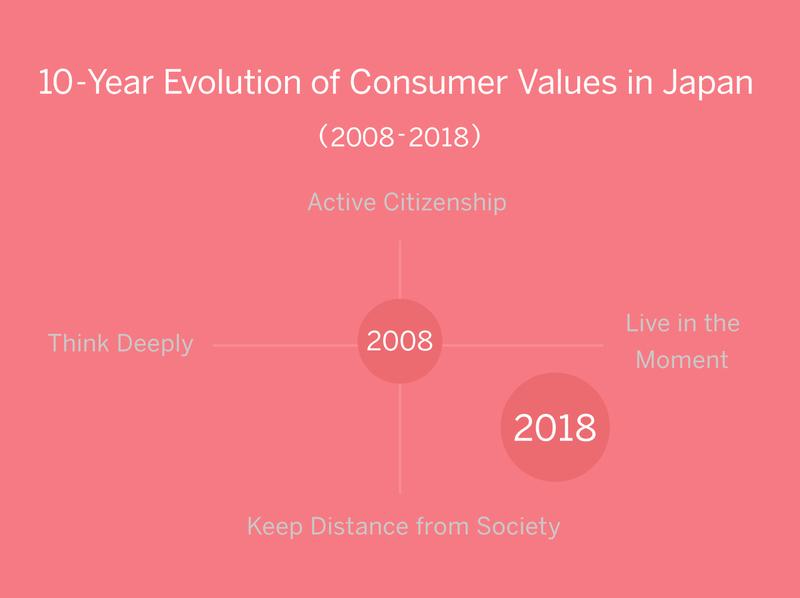 To sum up our analysis, we can say that Social Media in Japan can be classified according to usage, user’s age and values. The standard for private communication. Without bearing any of the personal broadcast or the leisurely overtones, LINE remains the paragon of Social media its quintessential form: getting in touch with other people. With a 50% national adoption and an active user base of all ages, LINE has imposed itself as the de facto standard for interpersonal contact. Easily generating intimacy and facilitating expression, its sticker function allows for smooth communication and thus strongly supports its position in private communication. For businesses, LINE is a major messaging platform that gives the opportunity to develop a wide range of communication-based services for customers. Twitter seems to be the place where young and introverted people go to check the news, get information about fashion, travel, cuisine, sports etc. and share information. Its short text constraint and imageboard style seem to suit well young introverts who do not like to read or write convoluted information. Offering anonymity and a format of short-sentence tweets, Twitter matches at least one of the needs under the current social trend of cynicism （※1） : [Setting a clear distance from society]. As for businesses, Twitter can be useful for linking their offerings to users' interests and sharing news about their products and services. Instagram can be seen as platform for outgoing young people. They can get information about fashion, sports, travel etc. as well as share information about their hobbies. Such sharing of beautiful pictures and videos without much text is popular among the extroverted young people. Without getting into too complex topics, Instagram allows to upload one’s favorite images and videos, and to easily come across topics of interest, pictures and videos of celebrities, etc. As such, it matches another of the needs under the current social trend of cynicism （※1） : [Living in the moment]. For businesses, it can be a useful platform to improve their brand image with pictures and videos. It may also contribute to brand loyalty. Facebook seems to be favored by sociable older adults. Facebook has many uses but none of them is particularly high. 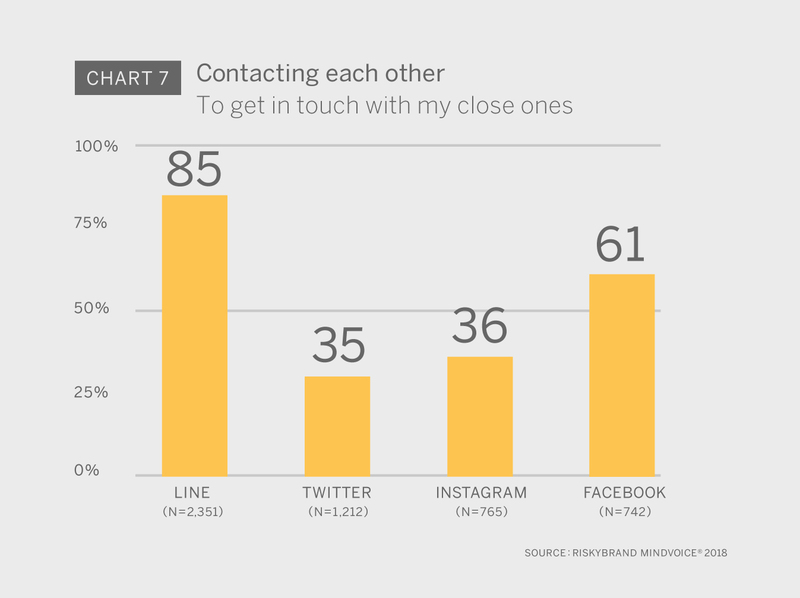 61% of active users use it to get in touch with each other, but LINE is far ahead with 85%. It is mostly used to share information and opinions. 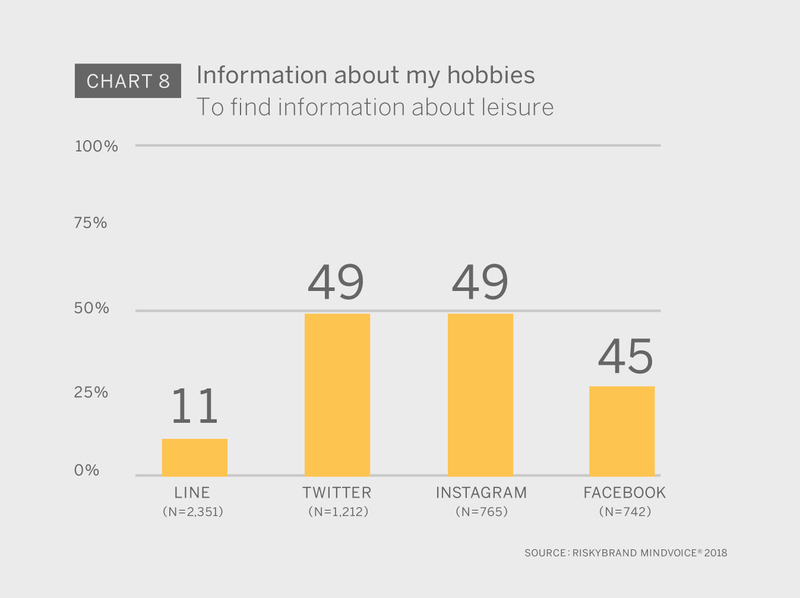 Otherwise common activities like researching about hobbies and checking the news are not that common on Facebook. 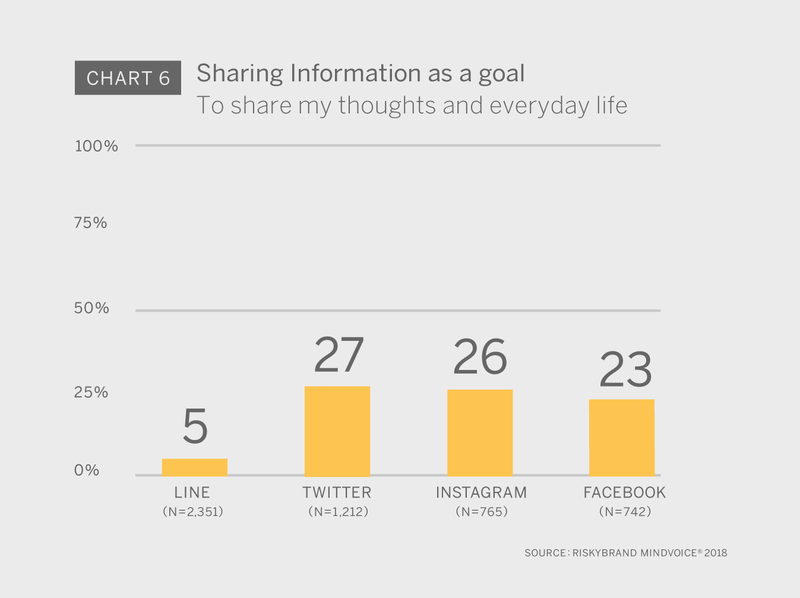 While personal information is shared on Facebook, users consider it as a platform where they’ll find neither useful news nor information about leisure. Perhaps younger users have also been deterred by this positioning. Such personal updates and curated presentations of self may be too remote for younger people who favor the kind of cynicism （※1） they can find with Twitter or Instagram. With such a positioning, businesses can see Facebook as a channel where they can reach middle-aged and elderly people with information about travel, savings, post-retirement leisure and the like. However, if trust in a corporation is an important element with middle-aged people, the revelations about mishandling of private information and Facebook’s disappointing initial response may cause marketing efforts on the platform to be counterproductive. If Facebook earnestly works to restore trust, it may strengthen its position as a platform with access to middle-aged people. With an attitude of disdain for society and authority, and rather than reflecting about the past, the tendency to value the enjoyment of the present conditions. For details, see “Japanese turning towards cynicism: Changes in Social values in the last decade. The Values Matrix was created using Principal Component Analysis and plotting the principal components onto two axes. The vertical axis (First Principal Component) shows the respondent’s attitude towards change and diversity, ranging from [Seeking Change/Diversity] at the top, down to [Conservative] at the bottom. ・ I take any opportunity to meet people with different values and opinions from my own. ・ I try to do things that benefit society and mankind – regardless of how they will affect me. ・ I am very interested in events, and their consequences, occurring in faraway places of the world. ・ To a possible extent, I’d rather not have to deal with others. ・ I think Japanese are a superior people. The horizontal axis (Second Principal Component) plots the respondent’s character as [Introverted] on the left side and [Outgoing] on the right side. ・ I seek something to heal my heart. ・ I don’t think that the lifestyle or circumstances of others has any bearing on my own. ・ I make friends easily with anyone – older, younger, male or female. ・ I am good at using my sense of humour to lighten the atmosphere, no matter the situation or how tense. ・ I tend to wear expensive or luxury items.